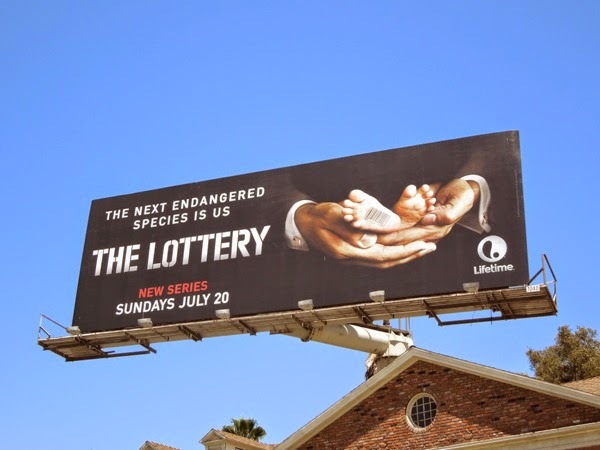 Can Lifetime strike it lucky this Summer with its new sci-fi drama, The Lottery? Set in a dystopian 2025, the world faces a global fertility crisis with humanity on the verge of extinction. No stranger to a world where women can't bear children is the series writer, Timothy J. Sexton, who was one of the writers on 2006's movie, Children of Men, which also featured a future where women could no longer become pregnant. The world seems doomed, until after years of research 'Dr. Alison Lennon' and her team manage to fertilize 100 embryos. 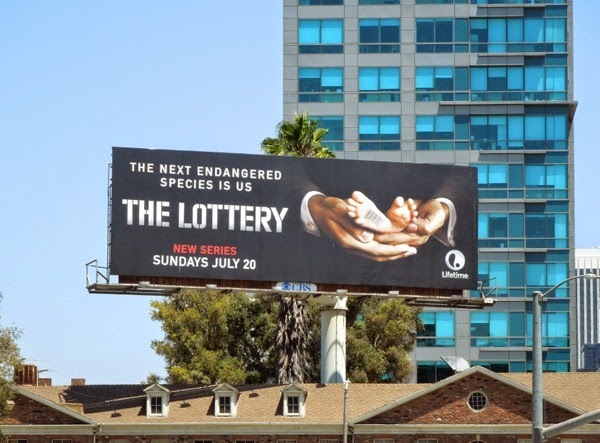 When the U.S. government takes control of her lab, the President is convinced by his staff to hold a national lottery for the highly coveted embryos and the battle for their fate begins. 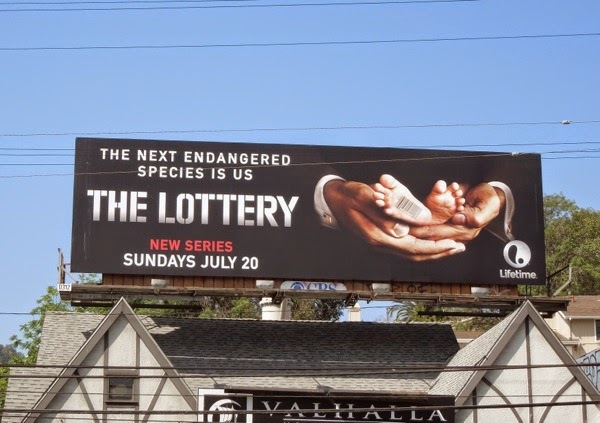 Daily Billboard thinks this barcoded baby's foot is a subtle, but evocative, ad creative for the new series and also likes the nice touch of the American flag cufflinks, suggesting the U.S. President is holding the fate of the future in his hands. 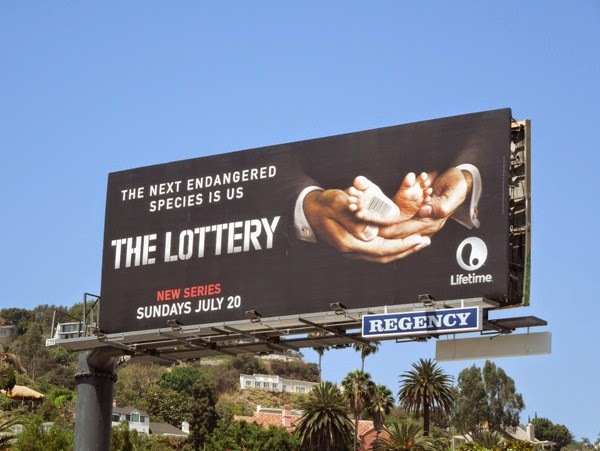 These series premiere billboards for The Lottery were spotted along L.A.'s Sunset Plaza, Cahuenga Boulevard and San Vicente Boulevard from July 8 to July 10, 2014. 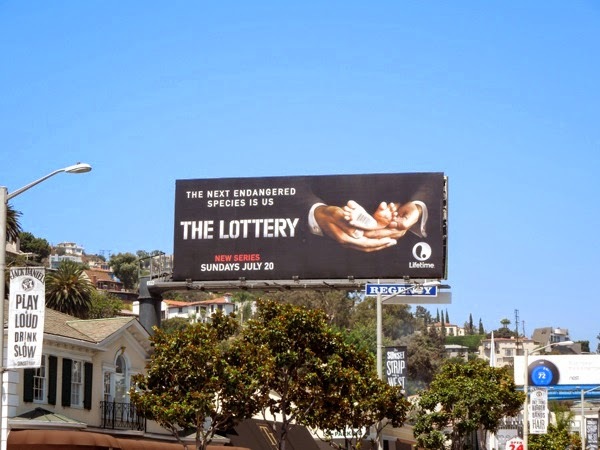 Plus for a different kind of lottery billboard, be sure to check out these Believe Powerball billboards for the California Lottery. 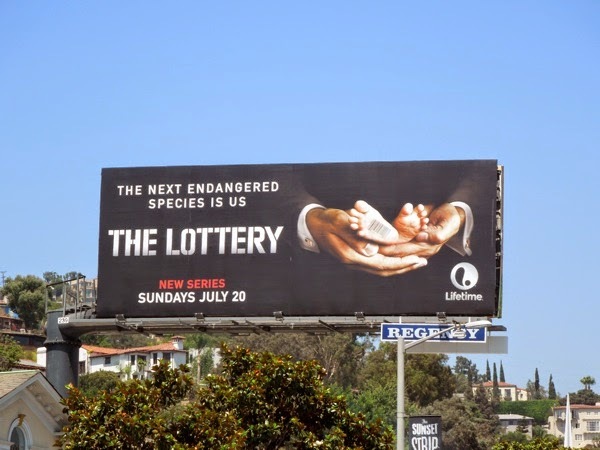 Meanwhile let's keep our fingers (and toes) crossed that The Lottery will be a winner for Lifetime this season.